The PS4800 features a Core2Duo P8400 (PS4800) processor, creating a powerful system for any production floor. Its aluminum housing adds to the PC's durability, while its multiple I/O ports lend to its flexibility. These units provide more robust storage options, along with quick and easy storage expansion. The bright and crisp TFT color display is also complemented with different screen size options. 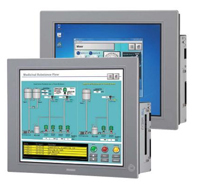 There are also stainless steel options for the PS4800 series, which supports ATEX. - External Dimensions: Dimensions dependant on unit model. See PS4000 Manual for exact dimensions.